Driventowrite is the name and to some extent the “driven” part corresponds to a form of sub-clinical obsessive-compulsive disorder related to arm-rests in mid-size passenger cars. But there’s a bit more to it than that. Good grief. 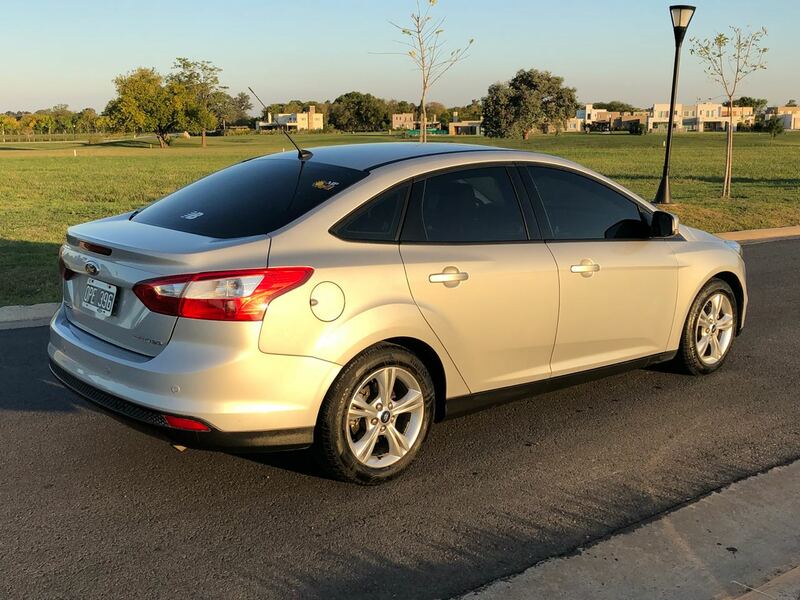 It’s a 2011-2018 Ford Focus saloon. get to that by the end of this tract. I walked around the car and gave it a close stare. What’s wierd about it is that it’s a very ordinary kind of vehicle that also is deeply rare. They never sold it in Denmark (I mean never tried to). I may only have seen a few Focus saloons since 2009 and since it’s a Focus it is not the kind of rarity that leaves a big impression. If I did see more of them I have not been able to remember. The Focus saloon is rare in the way a certain shape of pebble is rare – that precise shape confers no extra status on the pebble. Or the Focus. I am not seemingly connected to the same internet as everyone else so when I say I couldn’t get reliable information about the dimensions, indulge me. Presumably the Focus saloon is not very much smaller than the 1993 Ford Mondeo Mk1 (though the Mondeo will be a lot lower and obviously, right-sized), but, boy that Focus is a tall car for its length. Of course, we all know these car-like cars are much less popular than they were a decade ago. I suppose in the 1960s people said the same thing about hats: “I say, Jacqueline, have you noticed people don’t seem to wear hats so much?” Well, apart from people preferring cross-overs, isn’t it plain these saloon based on C-class cars are just as huge as people really need and that means the Mondeo and its peers are even less necessary. Which brings me back to opening point about corporate decision-making. Is it possible that car manufacturers didn’t spot that if they increased the size of C-class and C-D class each generation then the small class would get as big as people need and the bigger class would get too big to be useful? But of course and that’s why the switch-over to cross-overs is so handy because the heritage names of Focus, Astra, Mondeo etc with their baggage of size-expectations and status-expectations can be ditched. The Focus saloon here, which is as well equipped as a 1995 Mondeo, is a hold-over and anomaly more than anything; and the fact that so many of the later C-class saloons like this lacked that rear armrest is a tell-tale that, properly equipped, these C-class saloons undermine the case for the official top-of-the range D-class models. Don’t you think as I do that the sensible thing was to drop the huge, later iterations of the C-D class cars and call the Focus-derived saloons something else entirely? Maybe they could have been given a one-size bigger engine too. The presence/absence of the rear-centre armrest means more than at first sight. Evidently, car makers were unsure if the these notionallly smaller cars should be equipped with the same features as when they really were smaller. That’s why some makers fitted them and some didn’t. ** Also, this is part of DTW’s public service duty. There aren’t so many photos of these cars. It’s a pity the lighting was so bad – and twenty minutes later the car was gone. Looking at it now, it is a grudging saloon. It doesn’t look very saloony, more like a one of those hatchbacks made to look like semi-saloon e.g. the Citroen C5 or Xantia. Good morning, Richard. Regarding rear centre armrests, I think the decision whether or not to specify them is often driven by something more prosaic; whether the seat backrest is fixed, or needs to fold down. In estates or hatchbacks, where the backrests need to fold, they need to make it as thin as possible to facilitate a flat floor in the extended load bay. There is no such restriction in saloon cars. Back in the 1970’s cars as large as the Vauxhall Victor had an armrest in the saloon version, but not in the estate for exactly this reason. The split folding rear seat in my Chrysler (Lancia) Delta has an armrest. It is a Focus class hatchback. Counterexample: good old Peugeot gave their 406 a rear-centre arm-rest and those seat backs fold nearly flat (in the saloon) but the floor isn´t flat. The Citroen XM which is about the same size as a modern Astra has centre arm-rests and a fully flat floor. Ford don´t seem to care too much: the Mk 2 Mondeo has an “I don´t care” set of fold down seats as does the Mk 3. Indeed, Mark, that feature is the kind of thing distinguishing the Delta from many of its peers. I am glad you like your car – it´s distinctive in many ways. As you know I found the detail execution fell short of my expectations. Perhaps the issue is that Lancia did their best with the general spec and Fiat engineers dumbed it down. I have never seen a Focus of that generation in 4 door saloon shape. I guess it was developed for the US market in the first instance. It’s not a bad effort. Not sure about the rear lamps, but you can’t have everything can you, or so it seems. I note Honda is now importing its current Civic in saloon form to the UK and it’s better balanced than the hatch. I wonder how many sales are won or lost between rivals that do or don’t offer a saloon version of a compact hatch? Not many, perhaps, but often these days they seem better looking than the hatch version. Certainly, the breed has come a long way since the Orion, Belmont and LIANA saloon. The German market had the saloon Focus as did some southern European countries. I am prepared to be correctected on this: the US-market Focus is quite a different beast from the EU model so the American saloon is not the same as the one we see here… no…I have corrected myself. When the mid-size hatch was smaller (I am thinking up to the early 2000s), a saloon version made more sense and I think may have added marginally to sales. These days a saloon based on a “mid-sized” hatch is as big as a 2000s saloon e.g. Mondeo Mk2 or 406 or BMW 3-series of the day. There really isn´t much need for the successors to the Mondeo Mk2, 406 et al because the nominally “mid-size” cars are at or near most people´s needs. I think the Belmont was a better conversion of a hatch than the Orion. The Liana is cherishably strange. I´d love to meet someone who bought one new to ask about their car needs and tastes. Plainly these people existed – Lianas aren´t rare. I´d never have thought there so many who wanted a car like that. Maybe they wanted a Suzuki of some sort, maybe the brand led the sale. I think it was the price to metal quotient? I agree though, it’s a quirky and lovable thing. Sadly Suzuki never offered it with anything but mid-grey interior trim. I would like to have seen it in bright colors which would have suited it very much. I think I have only ever seen them in metallic grey paint too. There may have been white and dark grey metallic ones as well. That was a missed opportunity to lure customers on the look out for something fun. Plainly Liana customers were not swayed by mainstream preferences. One of the fun by-products of going on foreign holidays is having the opportunity to see these saloons that aren’t sold in the domestic market. I didn’t even know there was a saloon variant of this Focus, which is strange when you think about how many Ford Orions you used to see. I think the widespread lack of the folding rear centre armrest nowadays is nothing more complicated than being a cost-saving measure. True, it does save money yet all the manunfacturers face the same demand for lower cost. Some chose to keep the feature. And there are other ways to save money besides robbing a seat of one of its important capabilities. Behind this rather tiny detail is a wider more general matter of how empathy is a factor in designing a product. The designer has to imagine what other people need and also, I would hope, derive some professional pleasure from satisfying that need. All the lovely refinements on a 1970s Rolls Royce are to do with that sense of professional pride, I feel and also pride in the marque: how can we make the nicest car to own and use. My other little obsession, the cigar lighter and ashtry is another courtesy feature driven by consideration of what is nice to have in a car. Add to this left and right side lamps in the boot and ones overheard in the rear for parents to see when buckling kids into safety seats. BMW´s E36 3er had rear safety belts which were locked in place on the outboard side of the seat. For anyone with a child seat that is a boon. Opel´s Astra estate has a high lock point for the luggage roller cover so you can get it out of the way without losing it in the back of the car; Citroen put nice little stores in the armrest of the Xsara and the XM had a small sun-blind over the rear-view mirror. Eventually some of these things become a bit absurd such as powered head-restraints or self-closing glove boxes. This kind of design is (predictably) much more interesing to me than another bit of wiring and a digital feature. Are Mondeos, Passats, Insignias et al still popular in Turkey? Mondeo is faded away,Insignia barely sells.The Passat is the dream of every family man.Preferably in white 1.6 tdi dsg. Murat: does the Passat have some USP that supposedly trumps the Mondeo and Insignia? I mean apart from its badge. And the Renault equivalant (I have forgotten the name) ….Talisman: is that also invisible? There is the Megane sedan which must do all that the Talisman has to do too. Why´d anyone buy a Talisman? Two things about VW Turkey: one, the cars are shown in nice colours. And two, there seems not to be a Jetta or Vento on offer. So, naturally, customers are shoved from Golf to Passat or Tiguan. I also see no Sharan. If Renault want to sell Talismans they need to dump the Megane saloon. Or would that be commercial suicide? Opel are still selling the Astra saloon, based on the last model Astra. I see from the Opel images there is also quite severe lens flare in Turkey. Is nowhere in the world free of that phenomenon? I would say the USP is DSG transmissions.The residual value is a plus too.Otherwise why would people put up with such a bland design is beyond me. Jetta is a Turkey favourite as well.It sells more than Golf.It’s probably off site because the new gen is arriving. Sharan is a victim of tax bands here.Cars above 2.0 liters are subject to %160 percent tax.They sold few 1.4 tsi’s but it’s not the best choice for a Sharan. Re Astra sedan:Its what the market wants,also it’s quite cheap to buy since its a old gen.
Murat: thank you for the market insight. Well done VW for creating the illusion of prestige. Personally, I can´t see the Renault as having any less of the stuff than the VW. I can´t argue with how other see it. I lost interest in the Passat in 2005. I never accepted that car´s bloated appearance and lack of a strong theme. If ever there was a Passat that lived down to the cruel stereotype of a Toyota, that was it. Everyone else´s cars in that class were nicer bar none. What do I know though? VW sold billions of them and it was like a flamethrower product against the competition. These ‘small’ (but not really small) ‘shatchbacks’ lack the gravitas of larger / stand-alone saloons, but are also considerably less funky / useful than the hatchbacks on which they’re based. You can see why people would buy SUVs in preference to these. I think the problem goes beyond a name or sheet metal changes; Volkswagen tried for years to position the Jetta / Vento / Bora as something distinctive and upmarket, but it never worked, from a UK perspective. It´s the glass half full or half empty, isn´t it? These saloons based on hatchbacks are a bit cheaper than the full-size vehicles which have got too big for many people. They are also a bit more formal than the hatchbacks. I don´t think saloon buyers want what an SUV offers. However, for deeper societal reasons there are fewer people who want what a saloon offers. I´ve been a regular four-door user for four years and while I accept I am not Mr Ikea/jet-ski/garden deforestation man, I have not noticed any inconvenience and the saloon feeling is rather nice too. I have ties. I have never driven an SUV or a cross-over. I don´t know anyone who has one actually except – a-ha – a relative who I am not very well disposed to. Looks the same as the Focus sedan we got here in Canada 2012 to 2014 model years. It was all part of Mulally’s One Ford thing. About half and half saloons to hatchbacks on the roads – major niggle is that you have to own no legs to inhabit the back seat in either version, plus the incredibly awful DCT with dry clutches and herky jerky takeup and loud clonks. They refreshed the sheet metal a bit in 2015 I believe. How many photos do you want? It’s all on google. Mazda is doing exactly the same thing with the 3 and sells more saloons than hatchbacks would be my guess. Different markets prefer different versions. Have driven several Foci and as a car for the driver they’re really quite nice. The first time I turned around to reverse, it was impossible not to notice the about three inches for rear-seat passengers’ legs, and I’m only 5-9. So I tried the rear myself, uh, not great. Four doors for nothing. The Mazda3 is even better to drive with astoundingly accurate steering. And then there’s the Fiesta if rear-seat torture chambers really appeal. I’m a saloon person who would take a liftback if they made it for a car I liked – the only one we have on the market now is a version of the Insignia sold as an overpriced Buick, and with PSA now owning Opel I wouldn’t touch it anyway. Imagine the spares situation down the road. What about the BMW iNext? Looks like an electric motorized wild pig from the front with a grille like a WW1 armoured car. Snouty. Looking forward to reading what DTW thinks of this and the prose that accompanies it. Ah yes, the iNext. I had a very similar reaction, but your description is just perfect. For me, the iNext is the final straw. Until now, the i3 in particular encouraged me to hold out hope for BMW design, but if the next wave of BMW i cars look anything like that then I think it should seal the fate of van Hooydonk. SV: I am going to deal with the iNext soon. Indeed, it is a beauty. I can´t guess what kind of forces are acting upon BMW design at the moment. It is a dead certainty that the staff are all trained and very capable in their own way. So why and how does all that talent produce designs as unsettling as the iNext? Hi there! Really common sight here in Argentina. I guess the Latin American market always requires a saloon version of a hatch. We have the saloon version of the C4, Focus, Cruze, 308, Civic, Corolla, Fiesta, etc. Also the Fluence was a better seller than the Mègane. The Focus is a strong seller and also a product made in Argentina.